I built up a small army. Every unit is based for Honours of War. But the WAS around Freiburg is my maintheatre. 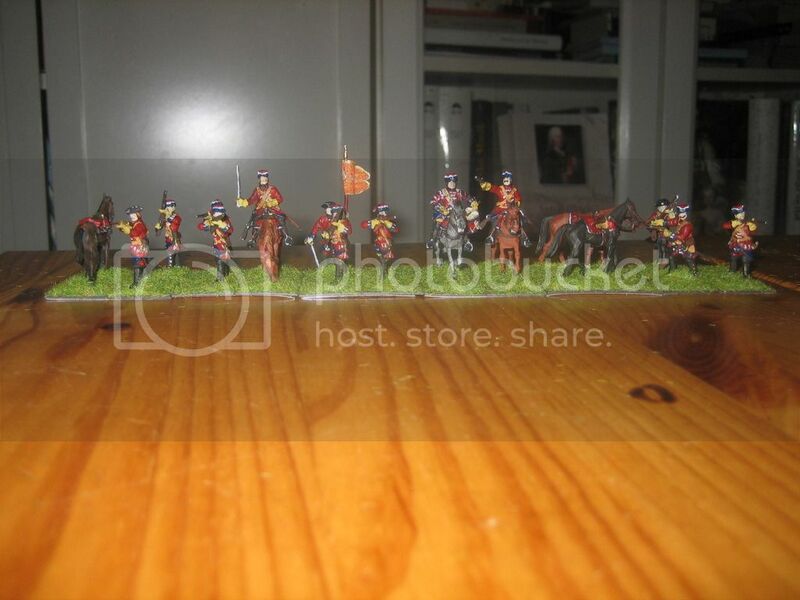 Here are my first 2 French cavalryregiments (painted by Mietpinsel - a german paintingservice). 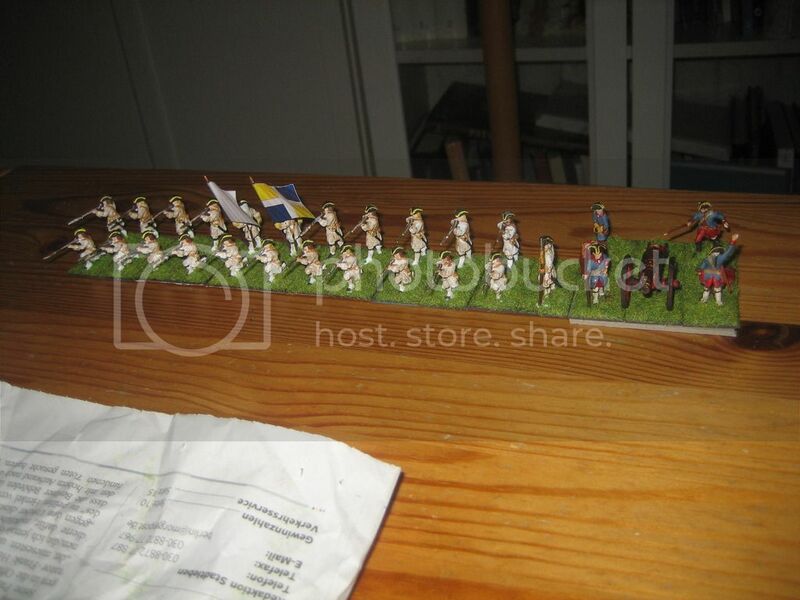 Our first infantry: Regiment Artois. Nice! 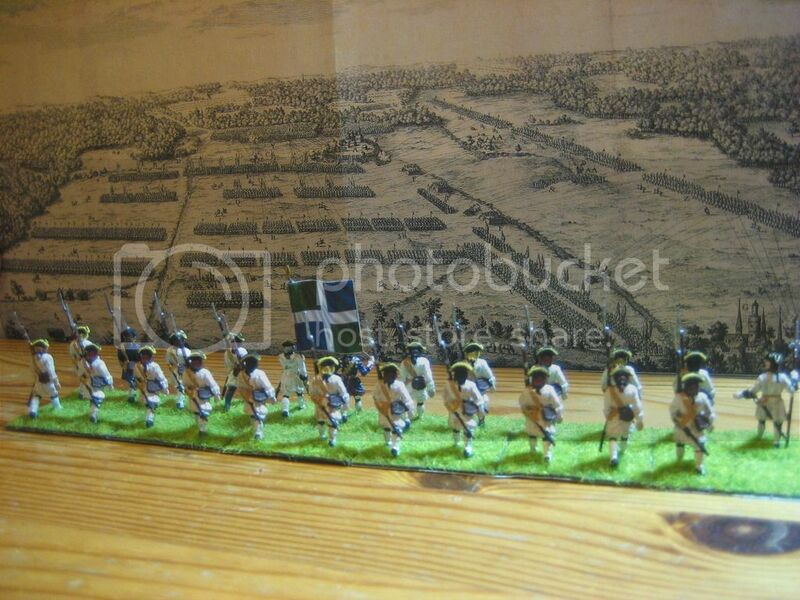 Excellent to see you making the most of the Zvezda figures - a shame they don't do a bigger 18th century range. It's true. But I mix the swedish infantry and the russians. In comparison to the Revell-figures These are realy good miniatures. 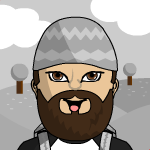 My next example. Régiment La Marine. I thought that 20 men looking the same were boring. One of them is a poor volontaire. There were a lot of normal farmers defending redoubts in the Alsace. Excellent! I use these too. I like the colours. But I don't know what to do with the collars. The plastic is to hard to cut it away. The flags were no Problem. The original flags are - in my opinion - much to small (infantry) or much to big (cavalry). To get an Impression I had the first cavalry unit with a painted original flag. Afterwards I've sawn a lot of temporary paintings and resolved to make small paperflags. 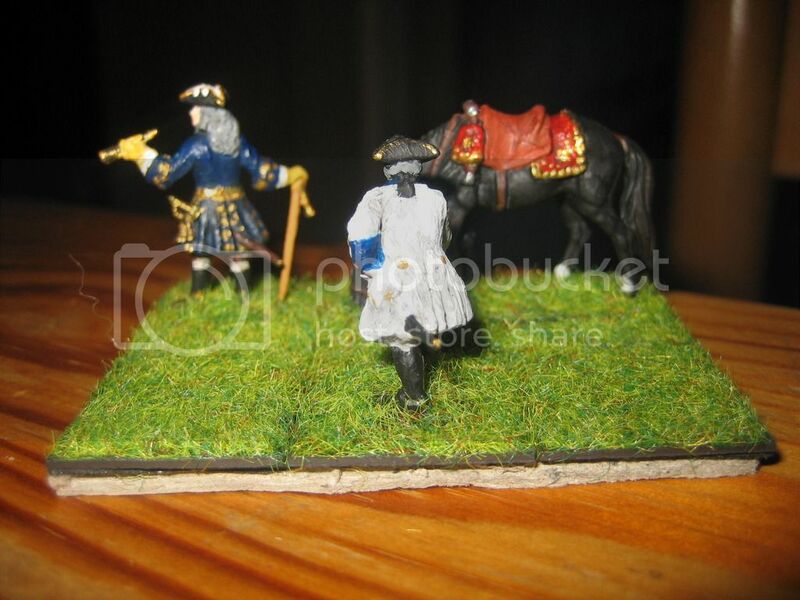 I think that the look is better because of the natural style of the miniatures. 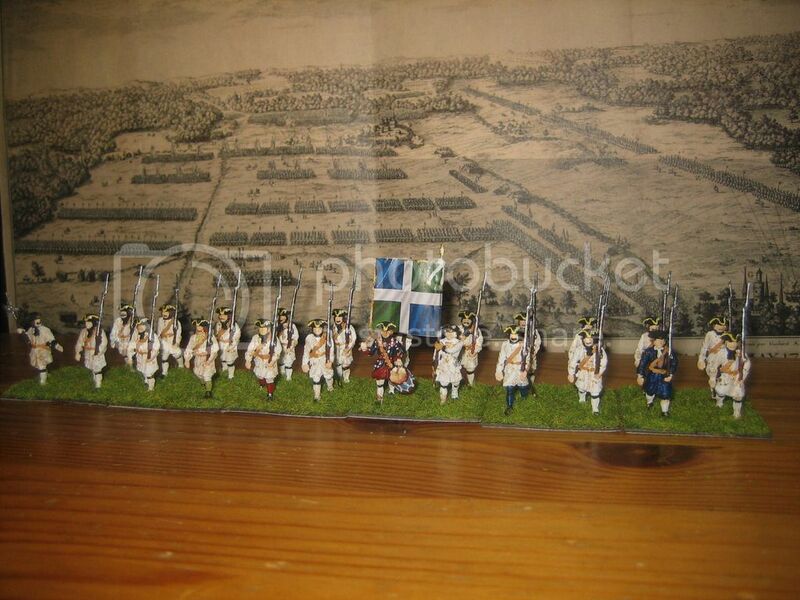 But more comicstyle-miniatures with big heads can bear flags which are not in scale. Good work Damnitz, 1/72 plastics have come on leaps and bounds fro the old days of Airfix and offer so many possibilities. I would not worry about trimming the collars the area does not stand out in any of your photographs. Yes, the downside of 1/72 plastic is it is not as user-friendly for conversion or paint adherence! Personally, I'm not too fussy on absolute historical accuracy regarding uniforms - but I think you've done a great job! That's a good looking army which is starting to take shape. 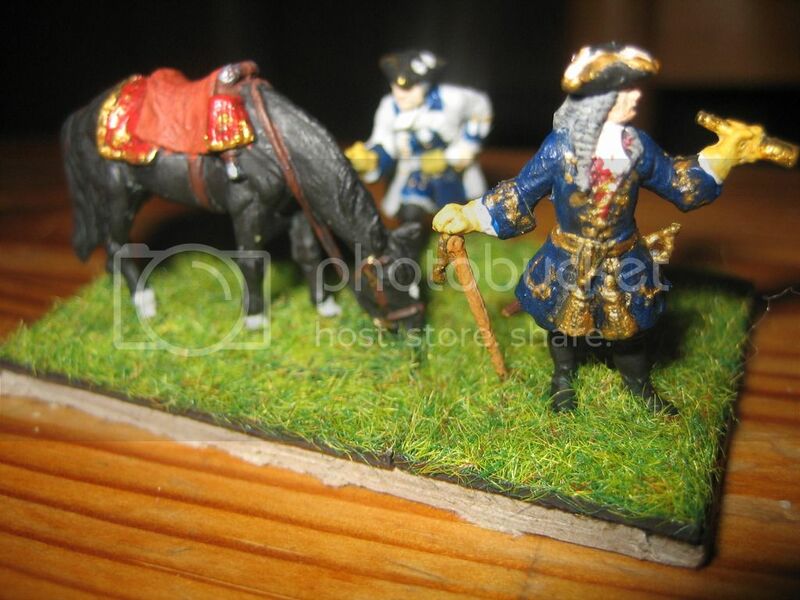 This is my first Lieutenant-General with his Aide de Camp. 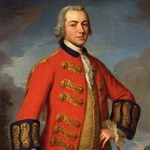 The Aided the camp had in the 1740s still the uniform of their regiments. In this case it's the Régiment Royal la Marine. Very nice, Damnitz. Are these 1/72 plastics as well? Yeah. All of my figures are 1/72 Plastics. They are all around 24 mm high. The General and his Aide de Camp are from Zvezda. The General was originally the officer in the GNW-Set of Russian Artillery, his Aide de Camp was a gunner of the same set and the horse is from the Swedish Dragoons of the Zvezda GNW-Range. I think they are appropriate for the French staff of WAS except the golden sash. Altough you can see sometimes sashs on portrays like this: fr.wikipedia.org/wiki/Fran%C3%A7ois_de_Franquetot_de_Coigny#/media/File:Fran%C3%A7ois_de_Franquetot_de_Coigny.jpg Ok, he was a Maréchal de France. a scalpel is for. Converting is cheap and easy with plastics. It's not realy easy with this hard plastic by Zvezda. 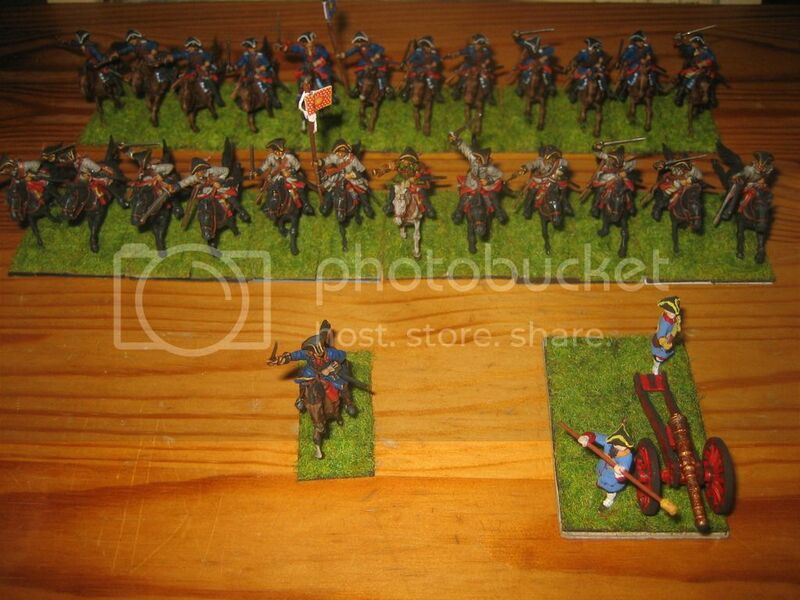 But I will try to convert the russian and swedish dragoons to French dragoons. 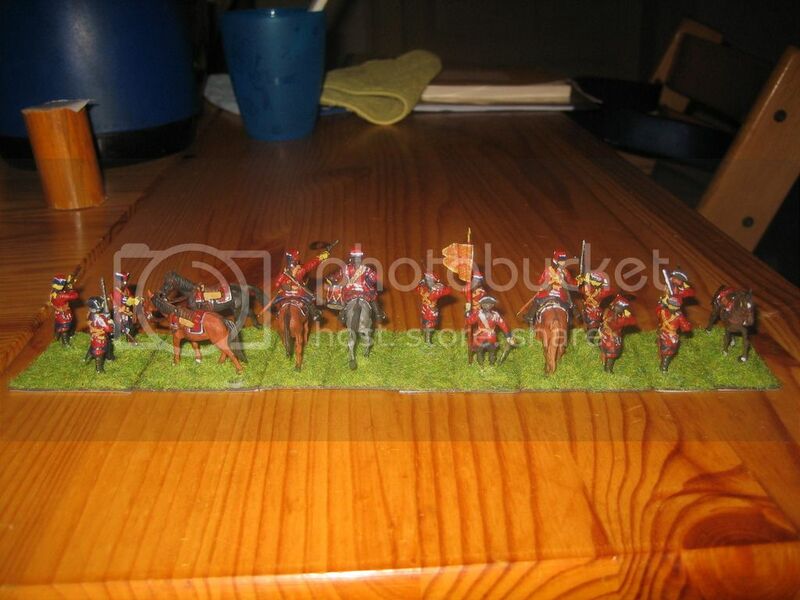 I've to cut off the brim of the hats because the dragoons in my period still had only their bonnets. Officers had hats. Now here is my next maréchal de camp. 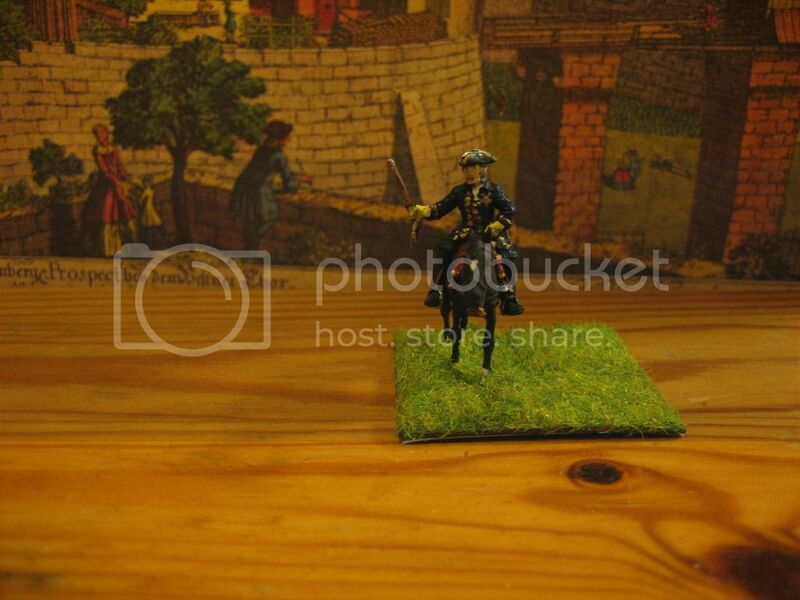 He commanded a french cavalry brigade today and was a dithering commander in his first battle! But I like the figure. Originaly he was a soldier of the swedish train from Zvezda. I cut his whip. Now he has a walking stick and don't looks as he is in a good humour.